Oral healthcare needs vary from person to person and even between age groups. That’s one reason our dental office in San Diego believes that individualized dental care is the best approach to keeping our neighbors healthy. 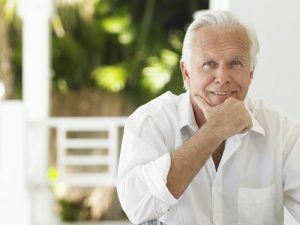 And while several common dental concerns remain consistent through every stage of life, there are some unique ailments that tend to specifically affect the senior population. Join us as we take a closer look at some of them. Tooth Loss – Many people believe that as we get older, we’re surely going to lose our teeth, or at least one or two of them. But this isn’t always true. It’s absolutely possible for people to keep their natural teeth for their entire lives, especially if they take proper care of them. This means brushing and flossing every day and seeing the dentist in San Diego every six months. However, several things can increase the likelihood of tooth loss in seniors including a history of smoking, dry mouth, untreated decay, and gum disease. While we can’t stop ourselves from aging, we can take preventive steps to protect our oral health and bodies. Make sure you always brush twice a day and floss once a day, no matter how old or young you may be, and be sure to get a professional dental cleaning and check up at least twice a year. If you’re overdue for your dental appointment, we welcome you to call our San Diego dental office to schedule a visit with us today.